I have a second post for today! This time I used Mercy's Tuesday sketch. I also used the Stamp TV potluck Friday challenge. It's being hosted by Giovana, another one of my fellow CSS design team members! She wanted us to use Gold. 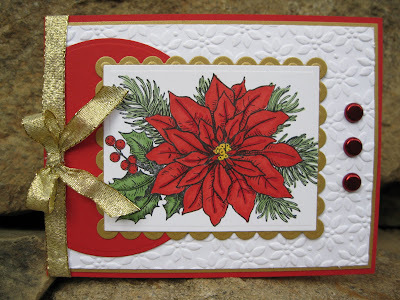 I used the new Gina K Good as Gold Metallic card stock, Love this stuff! I also used some gold ribbon. janice...this is spectacular! that flower is just drop dead gorgeous, sister! amazing christmas card! saw this on STV and had to comment again - super beautiful !!!! wow, what a gorgeous card, great details.... have a wonderful day!